Yesterday saw another milestone in the Swedish food revolution. 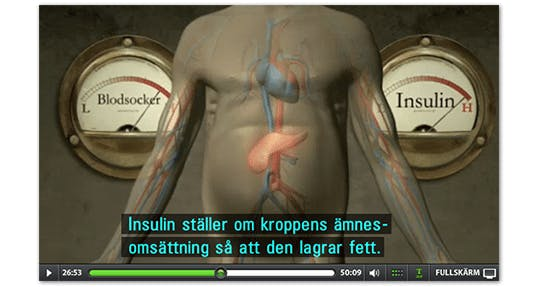 The biggest science show on Swedish TV had a long segment on the LCHF movement and the diet advice to type 2 diabetics. They followed a group of type 2 diabetics during a course in LCHF, documenting their spectacular health improvements over three months. They interviewed experts and dug through the science, concluding that there is no scientific evidence for the conventional high carb advice to diabetics, and no proof that eating LCHF is dangerous. In fact the smaller studies that exist only document improvements in health from eating LCHF. After this show my Swedish blog (translated by Google) had another new visitor record: 22 712 visits in one day. It just keeps going up. The revolution is spreading and it’s probably just a small taste of the huge world-wide paradigm shift we will see during this decade. A health revolution. Would be interesting to watch! Excellent news Doctor Andreas! It will inevitably go mainstream before too long. Just a note on English (darned crazy language!) where you say "They interviewed experts and digged through the science..." you might instead say "They interviewed experts and *dug* through the science" or "rooted through the science". sadly things in the US still seem bleak to me... I clicked on CNN health and there was 2 low fat/diet articles and The CNN health expert calling paleo a fad and that it was unhealthy due to its high fat content. But at least there where a lot of people who commented who disagreed. Thumbs up for Sweden, Dr. E. and Dr. Annika Dahlqvist who laid her career and reputation on the line in her fight for LCHF. Wish we could watch this! When shopping for groceries the other day I heard an announcement by a "health consultant" talking to me over the pa system. Her message was (and I am not making this up) to "fill your basket with mineral water, fruit and vegetables - and then carry your purchases home on foot". What will they come up with next. I wouldn't be too surprised if a translated version of this video was uploaded on Youtube, soon. I'm surprised that these researchers weren't aware of the time it takes to become ketoadpted. I've only been able to cut and paste the text into google so I can't guarantee my understanding of their conclusions is accurate but I'm surprised at the overly negative interpretation of their evidence. For Swedish readers there are some useful recipes attached which may be some compensation. I can't find any mention of kokosolja (coconut oil) and I think if people want to avoid Induction flu that using coconut oil for a while before reducing carbohydrate intake may well help the process of adapting to burning ketones. I hope you're right Jaus, because it would be a shame otherwise. I'm sure we're a lot of Swedes around the world who'd love to see the program. I am glad that people that can be helped with LCHF diets will get better advice as more resources are invested into proper science rather than voodoo scare tactics. However, I am not glad about LCHF going mainstream. That surely will turn it into a fad and then we will never hear the end of it. And, Doc, thank you very much for your efforts on this blog. I would definitely like to see the video. Translated or not. Pls, someone upload it somewhere where it can be downloaded/watched. I thought the host did a great job of introducing everyone to the concept by asking them to prepare food together, then testing their blood sugar. If I were a crusader, I'd use that very technique. Breakfast. Whole-wheat pancakes or waffles, one piece of fruit, 1 cup of low-fat milk. Lunch. Chicken kabob, 1/2 cup of steamed broccoli, 1/2 cup of cooked rice, 1/2 cup of juice. Dinner. Pasta primavera prepared with broccoli, carrots, zucchini, yellow squash and Parmesan cheese, 1 cup of low-fat milk. Snacks. Six homemade crispy corn tortilla chips, 1/2 cup fresh vegetables with a seasoned garlic sauce." Carbs with every meal!! I couldn't believe it! @Ted Hutchinson, "if people want to avoid Induction flu that using coconut oil for a while before reducing carbohydrate intake may well help the process of adapting to burning ketones." Huh. Never thought of that, but it explains why I never had any problems cutting carbs way down almost over night without any "low carb flu." I've been using coconut oil a lot for the past 6 years! I just like the valuable information you provide in your articles. I?ll bookmark your weblog and take a look at again here regularly. I am reasonably certain I will learn a lot of new stuff proper right here! Good luck for the following! I was translating this to English in October, but a hard drive crash destroyed everything and I lost not only the video file and the translation, but also the will to translate it again. I have now decided to start translating this from the beginning again, but this time I will take it slower.